A recent state report calls into question the state levee system’s ability to sustain an earthquake or other natural disaster. The state’s levee system runs 13,000 miles: a distance equivalent to driving from San Francisco to New York City and back, twice. The complex chain of channels and dirt mounds is responsible for delivering more than two-thirds of the clean drinking water to California homes and protects nearly $47 billion of property from flooding in the Central Valley. These levees are part of what’s called the State Plan of Flood Control (SPFC), which are attached to the main SPFC levees. State engineers studied approximately 2,100 miles of these critical levees for the report. According to new data obtained by NBC Bay Area, 49 percent, or 157.2 miles, of levees located in urban areas, which protect local businesses from flooding, are considered “high hazard”. Over 56 percent of the non-urban levees which are responsible for separating drinking water from salt water are considered high hazard by the state. In the San Joaquin River Watershed, 73 percent, or 291 miles, of NULE (SPFC) levees are considered high hazard. Many of the dirt and peat levees in California are over a hundred years old. According to experts, if the levees break, the concern is twofold: local businesses and agriculture would experience flooding and Californians living in the Bay Area or Southern California could have their drinking water contaminated. Morais is the third generation in his family to own Giusti’s Restaurant, built right next to a levee in the Central Valley. He worries, if some of the nearly 150-year-old levees break, his business would be flooded. The more populated areas of the state could suffer as well. “The delta is the hub of our water distribution system and there is some concern that earthquakes could cause enough of the levees to fail,” Dr. Scott Brandenberg, a professor at UCLA’s department of Civil and Environmental Engineering, told NBC. Dr. Brandenberg’s team has been studying the strength of the soil, or peat, that the levees sit on and its ability to withstand the pressures from extreme shaking during an earthquake. ”The kind of earthquake we worry about would be similar to the earthquake that happened in Napa Valley, maybe a little bigger than that,” Brandenberg said. “That would certainly result in strong enough shaking that would result in levee failures." California’s levee system was first built in the 1880s when farmers in the Sacramento-San Joaquin Delta wanted to prevent flooding on their farmland. While the peat was fertile for agriculture, it was not the strongest choice for levee foundations. It largely remains today. Brandenberg’s team built “mini-levees” on peat and other soils. What they found was that during an earthquake event, the earth under levees could become highly unstable in what they call “liquefaction.” In other locations, the peat can compact, undermining the levees sitting on top of it. That type of levee failure can also lead to salt water mixing with fresh water, contaminating the water supply, or flooding it altogether. If the levees failed in the wrong place, the resulting flood could also damage the aqueducts that carry fresh water to the Bay Area and to Southern California. A serious rupture of any of those aqueduct systems could take years to repair if it were severe. Several state grants and bonds have helped make levee improvement a priority at the California’s Department of Water Resources over the past decade. Most recently, Governor Brown’s California Water Action Plan just made $150 million available to improve urban levees in the Central Valley. The funding comes from the 2006 Disaster Preparedness and Flood Protection Bond Act or Proposition 1-E.
To date, nearly 300 levee repair sites have been identified, and more than 100 of the most critical sites have already been completed with AB142 funds. “Unfortunately, in California we have a number of exposures or hazards in our levee system,” said Gary Bardini, Deputy Director at California’s Department of Water Resources. Bardini is responsible for leading four different divisions and 850 employees at Water Resources including the levee system and state-owned flood facilities. Bardini said to get the entire system up to current standards will cost about $40 billion. The Investigative Unit asked Bardini if he was comfortable with the state’s levee system as it stands. “I don’t think anybody in the industry would say they are comfortable but would I say we are in a lot better shape than I saw ten years ago? Absolutely,” he said. The East Bay Municipal Utility District in Oakland, which provides water to about 1.3 million customers, is one of several local water districts, including San Francisco’s water department, that are helping to improve the system. So far, East Bay MUD and San Francisco Water Department have each spent millions on backup supplies, workarounds, storage and interconnectivity. Right now, experts say if the supply of fresh water from the Sierras were to be cut off, the Bay Area has about a six- month backup supply with rationing. “We’re working hard to understand what we can do to optimize so we can withstand emergencies locally and in the delta,” Alexander Coate, General Manager of the office told NBC Bay Area. It’s all because of that concern over the Central Valley levees and how their survival affects the Bay Area’s water supply. Southern California watersheds are at similar risk. 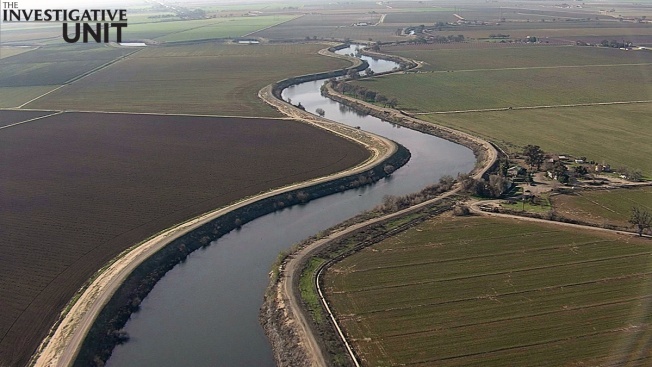 The California aqueduct, which supplies more than two-thirds of the water used by Southern California, also runs through the Sacramento delta and is protected by levees which are deemed at high risk for failure. Any repairs of major damage to the California Aqueduct could take years to complete. “In the worst case [the aqueducts] could rupture and then we could be cut off from the supply of water that is predominantly from the Sierras, that pristine snow melt,” Coate said. Do you have a story for the Investigative Unit?